The OM-DAQ-USB-2401 is a portable USB 2.0 full speed thermocouple/voltage input data acquisition module (fully compatible with both USB 1.1 and USB 2.0 ports) that can be used with either desktop or laptop PCs. This stand-alone module draws power from the USB port to operate and has 500V isolation to PC. An external power supply (optional) can be used. The compact, modular packaging ensures ease of use in a variety of applications. 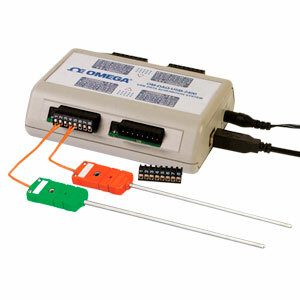 Units can be DIN rail or wall mounted with the included hardware or easily operated on a bench. All configurable options (including individual channel input type and range) are software programmable. The OM-DAQ-USB-2401 is user programmable for thermocouple types J/K/T/E/R/S/B/N and voltage input ranges from ±30 mV to ±10V full scale. A free Windows Software Suite that includes the DAQ Central menu driven Windows software is available for download from OMEGA. DAQ Central allows charting, data logging, file storage and virtual instrument viewing (digital meters, dial meters, bar graphs) of data in real time. No programming is required - simply point, click, and drag desired display options to create a virtual display screen. Additionally, for those users who would like to design and develop their own custom application program, the software suite includes a .NET driver for C#, Visual Basic and Visual C++. DAQ Central will run in demo mode allowing you to preview all the different functions in the software. Click on the Software button above to download the DAQ Central software and take a test drive! All dollar amounts on this site are shown in Euro currency. Note: *At highest scan rate, 1000 samples/sec +/- 1% with one channel on, +/- 5% with all channels on. Each unit comes complete with quick start guide, USB cable, hardware for benchtop, DIN rail and wall mount, 4 terminal blocks, 9 Vdc universal power adaptor, OMEGA screwdriver, and 2 Type K thermocouples with stripped leads (TC-TT-K-24-36). Free DAQ Central software available for download from OMEGA.